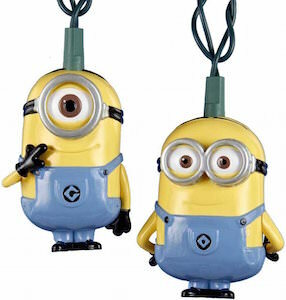 Minion’s are those fun loving crazy creatures from the Despicable Me movie. 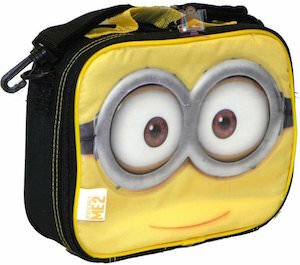 And now one of those Minions wants to go for a swim and that is why you can find this Minion on this women’s swimwear. This one piece bathing suit has the Minion on the front and he seems really excited with his eyes bright and shiny and his hands together like he is going to dive in the pool. 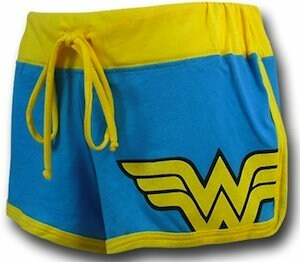 And this Minion is not just on the front of this swimsuit, you can also find it on the back. So if you need a fun new swimsuit then come look at this Despicable Me Minion Women’s Swimsuit. 25 years the Simpsons and means of course another fun calendar for 2014. This The Simpsons wall calendar will bring you months of fun with all the characters we love so much. 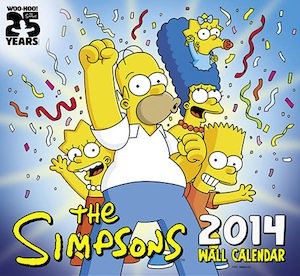 Of course this 2014 calendar will bring you Bart, Lisa, Maggie, Marge and of course Homer. Besides the whole Simpson family there will be many other characters we know from the show but I can’t tell you everything about this The Simpsons calendar because then there will be nothing new for you to explore. Each month in 2014 you will have a new Simpson picture and a great calendar to that will give you room to write all the important things you need to remember, like birthday and what day Christmas is this year. This t-shirt shows one of those famousely fun scenes from the Despicable Me movie. You see the unicorn plush and Agnes touching it saying “It’s so fluffy!”. Besides that this Despicable Me t-shirt also has lots of hearts. This t-shirt will attract attention in a good way because everyone wants a t-shirt like this. 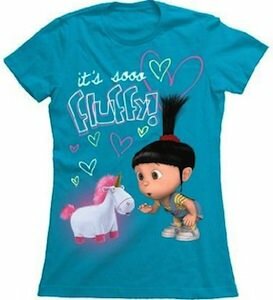 And this it’s so fluffy t-shirt is made out of 100% cotton and comes in a range of junior sizes to fit teenagers and yound adult women. 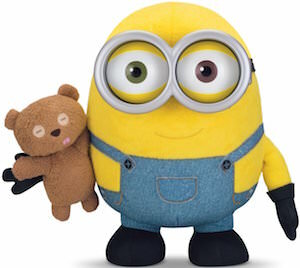 Come check out this Despicable Me It’s So Fluffy T-Shirt. 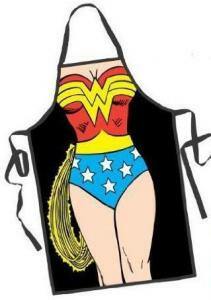 “BAM” “POW” your own little superhero will finish their meal in a flash with this cute Wonder Woman dinnerware set. 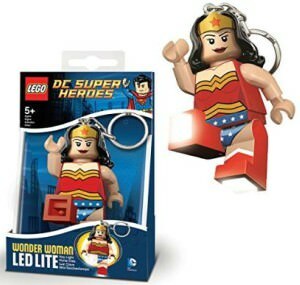 The three piece licenced DC Comic set has an 8 3/16 “plate, 6” bowl and 9 ounce glass and is made of strong BPA free plastic. 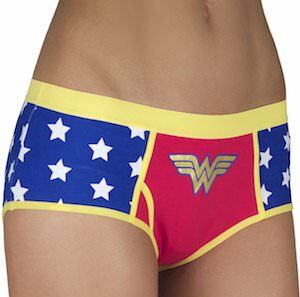 The white plate is trimmed in red and pink and has the picture of a child-like wonder woman dressed in her red top, blue pants, gold belt and gold tiara with red star. She is standing in front of a colorful rainbow and stars, and is showing her superpowers with her signature bracelets with stars. 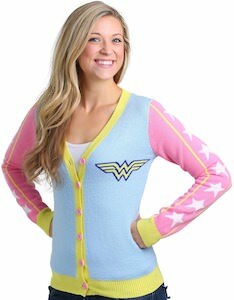 The glass also has the picture of the “chibi” Wonder Woman and says “WONDER WOMAN” while the bowl shows her head only. 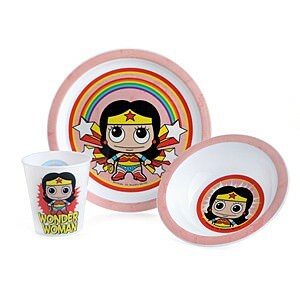 Children ages three and up will love this groovy Wonder Woman Dinnerware Set. Spongebob is making people smile by baking great tasting Krabby Patties and now you can own a binder that says that. This 3 hole binder is great for school work and I am sure that your schoolmates will love it to. 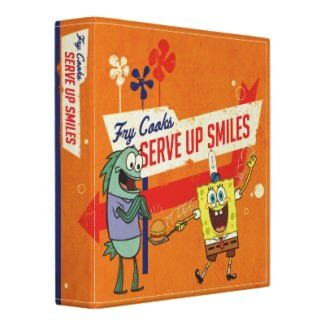 So go have a quick look at the Spongebob Fry Cooks Binder. 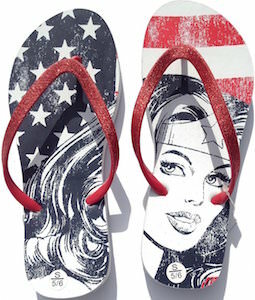 Are you a Barbie kind of girl? If so then maybe it is time to have some Barbie jewelry. This set of hoop earrings would be perfect. 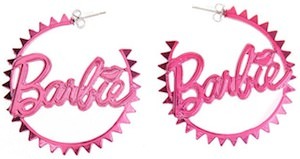 The earings are pink and have a metal base and the Barbie logo can be found in the middle of the pink hoop and it even has the Barbie lips above the I. And the hoops are not just smooth hoops no these Barbie earrings have spiky hoops. The hoops of the Barbie eaarings are 1 1/2 inch in diameter making them the perfect size so that they will not interfere with your head movements and still look fun. Come and have a closer and better lookg at these Barbie Pink Hoop Earrings. What better then a binder for school with Spongebob Squarepants on it? I know a binder with Spongebob and Patrick both on them. And there is more because Plankton is on the back. This 3 ring binder is great for schoolwork or other things you like to keep safe. 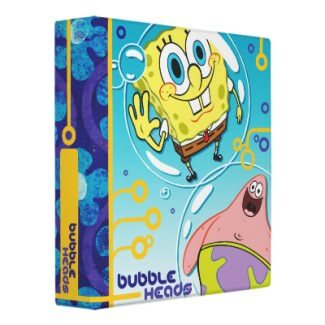 Have a closer look at this Spongebob Bubble Head Binder.